I discovered the technique mezzotint, one among of the intaglio techniques, during my university studies in Visual Arts at the University of Quebec in Montreal. It was during a major retrospective exhibition at the UQAM gallery, devoted to the Japanese artist Yozo Hamaguchi. I was seduced by the great finesse and refinement of his engravings, especially his still lifes; the accuracy of his graphic execution had nothing to do with the idea I had of engraving in intaglio. Therefore thus, I went from xylography (side grain woodcut) to the study and subsequently to the practice of the mezzotint. The singular spirit, mysterious and precise at a time of the mezzotint seduced me. This technique magnifies the light and the shadow while exalting the vibration of the white facing the fleeting beauty of the dark movements of the black. Later, Prince Rupert received all the honors of the discovery from English engravers, who greatly appreciated the process and gave it an extension and an original perfection, in the eighteenth century, especially in the portraits of famous men of the time. It is during the second half of the twentieth century that modern artists put the mezzotint back under spotlight among others the Japanese Yozo Hamaguchi, the Italian Mario Avati and so many other great artists around the world. Here is some information about preparing a copper plate to proceed with the execution of a drawing for the printing of a mezzotint engraving so much appreciated by modern artists. In the first place, it is a question of graining the copper uniformly of small holes, with a tool called: “mezzotint rocker”. EC Lyons rockers are known worldwide as the finest mezzotint rockers available. 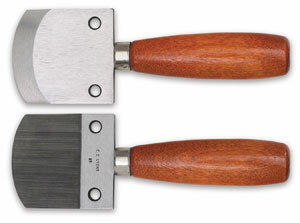 Lyons rockers have handles of stained birch and a tool surface of high carbon tool steel. The density of teeth for a rocker is measured in LPI or ‘tooth count’, a measure of the number of lines per inch on the cutting face of the tool. The grain must be extremely regular and tight to retain the intaglio ink to obtain a perfect and velvety black. The rocker is a semicircle thick blade fixed on a handle and bristling with tiny spikes. A swinging movement of the handle from front to back then from left to right allows starting the copper in a regular and uniform way. While XVll century engravers recommended two hundred forty passes for the plate to be correctly grained, the modern engravers make on average forty turns! Multiple passages in all directions make this stage particularly slow and tedious, but on this depends the fineness of the final result. In England, in the eighteenth century, mezzotint workbenches were set up : the mezzotint rocker was supported by a long arm, ended by a wheel, so that the arm could move forward and backward; a handle surmounted the arm, which was swung from right to left, saving time in the graining of the plate; modern engravers proceed pretty much the same way. To ensure the quality of graining, we proceed to print an intaglio print in order to obtain a deep and velvety black. It’s then necessary to begin the drawing using the scraper and or the burnisher that traces the pattern over the grain, by smoothing or accentuating the hollows to obtain the whites and halftone all in finesse. When printing the state proofs, the artist alternates between the intervention with the scraper and a new test, until the desired result is achieved. The mezzotint ’s probably the most elaborated engraving technique, the most subtle with its velvety blacks and an infinity of grays halftones, as well as bright whites; that’s why it was so popular for engraving portraits in the 18th century. To get an idea of the exceptional quality of the engravings, we can admire a large variety of prints at the “International Mezzotinte Festival” in Ekaterinburg, (Russia). This biennale offers Mezzotints from around the world. By practicing this technique my visual thinking get adapted to the developing process of the mezzotint because the execution time is very long, this way of working gives me time to think and dream. The maturation time is fundamental to develop the path of my drawings, to deepen the visual idea, to organize the duality of the shadow and the light and to think my composition in dynamic planes ; for me the time doesn’t exist, I compose with the passage of the life and the mystery, it’s for me a state of being and a meditative attitude. I think about my art and I’ve been working for several years on the relationship of man with nature, the environment is conditional for our survival on this planet. We are out of balance with the evolution of nature, man is destroying himself by the pollution of the land of air and water; my engravings symbolize an alarm call, facing the destruction of our living environment, we are in a state of survival in a technological society without a soul. There is so much pollution and waste in the sea, that the fish must go elsewhere in a fragile paper boat, look for another place of life, I emphasize here the fragility of existence. Man is in solidarity with other species who live on earth, we depend on each other in a common equilibrium. To survive the fish has to make its way through a plastic water bottle, to drink a few drops of water, it is a state of survival, the spiral is a trap created by our carelessness. I question our reality of earthly, are we wandering beings? Unconscious of the wounds inflicted on the earth, the blind bird walks on a tightrope to join the living tree on the other side of the valley. I am particularly targeting the destabilization of nature in the face of pollution created by man. My artistic journey is the opposite of pure narrative description, it’s metaphorical, more convincing by the symbol that makes an image. Creating a Blog is a wonderful initiative, I really appreciate this necessary notion for information about artists, in order to know their works, especially the “mezzotint” etching and other techniques in engraving, I would even say that it’s essential now to go through a blog. She was born in Argentina, emigrated in 1984 to Canada, lives and works in her workshop in Montréal, (Quebec, Canada). You can also leave comments below, she will respond as soon as possible. Nice article… I like it so much. Thanks for the visit! ? This is indeed a well done article. I’m glad that they put it up for all of us to read. You are so correct, we do live in our own mess and still do not take our existence on our planet as a survival test. A test that we are failing. Your prints are wonderful and they do show what we need to see. Thank you for your comment and visit Carol. I’m really glad you like the text and pictures. It’s just a little summary so everyone knows this magnificent technique a little better. Wonderful article as well as your artwork Deb! Thank you very much for appreciating, dear Bernard. I love your work Deborah, but then you know that already! Illuminating article as well! Dear Anthony, thank you for your words and for appreciating my work and the article. Deborah Chapman, I appreciate your article and work. I’ve taught myself using your advice and Carol Wax’s book to make my first mezzotint. There is no match for its velvety richness and I have more pieces I’m dreaming of creating. Your article has been a useful laughing point and now I’d like to take a class from a skilled mezzotint printmaker. Do you have any class or workshop offerings in 2019? I live in California but will travel as needed. If not do you have any workshop or teacher recommendations? Thank you for your time, any advice will be much appreciated. KARIN VON MAY, Thank you very much for your interest in this wonderful technique. I live in Quebec, Canada. At the end of 2019 I will be giving a workshop in South America but I can give you the name of an artist who lives in Seattle and can contact him on Facebook; his name is: Earl Valentine de Wald. You can also find me on Facebook as Déborah LuLu Chapman if you need anything else about the mezzotint technique, always a pleasure. Will it be in Argentina? Karin von May, Do you have Facebook or MSM?